Let the gardening begin! Last week right before we left town our seeds arrived and I was bummed not to have time to get the seedlings started. Today I finally had the time to get things going. Garden season 2016 has officially begun and I can’t begin to tell you how excited I am! I look forward to the first asparagus popping up through the dirt. The first spring lettuces. Don’t even get me started on the tomatoes, fresh off the vine and straight into my mouth. We are a little behind schedule this year. Normally our seedlings would have been started in early February. Life and it’s chaos got in the way this year! At least we still have plenty of time, we aren’t that late. 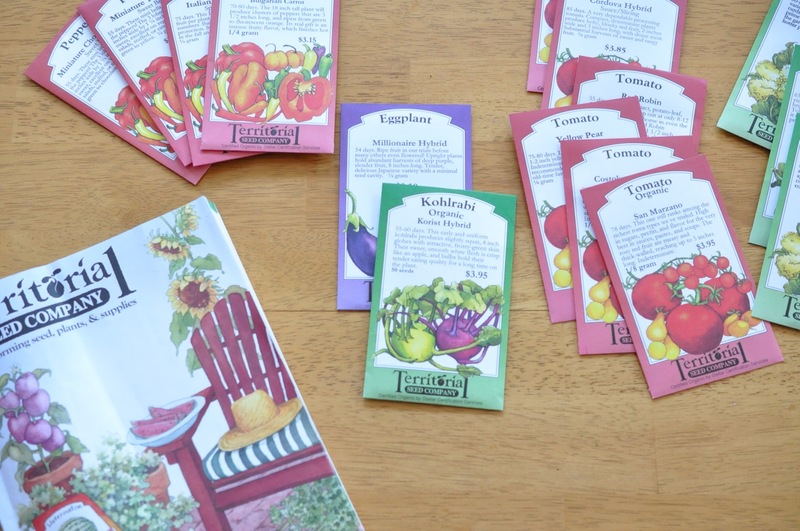 The hardest part is going through the seed catalogs and deciding what to get. I want so much, I couldn’t possibly plant it all. Eventually it comes down to what we will eat the most and is practical for us. The things I don’t use as often I can still buy at the farmer’s market. Tomatoes, that is my biggest challenge. I love them the most and there are so many varieties. They are all so different and used for different things. Cherry and grape tomatoes are perfect for snacks and salads. Then you have slicing tomatoes, canning tomatoes, sauce tomatoes… Sometimes I just can’t control myself. I showed great restraint this year and narrowed it down to six varieties. Generally we try something new every year too. Last year it was eggplant but it didn’t do too well. I’m trying again this year and hoping for the best. We also have orange cauliflower, okra and a few other vegetables we haven’t had great success with. Josh is planning on removing a couple more trees by the garden so hopefully I’ll get another row to accommodate my large selection of seedlings! Last year the tomatoes were out of control and bent all the cages so we need a new staking system for them as well. So anyway, back to my seedlings for this year. It’s a pretty simple process and there are many ways to do it. I like to fill my containers with the soil and then get to work. I cut skewers short enough that they will fit with the lid once it’s on. 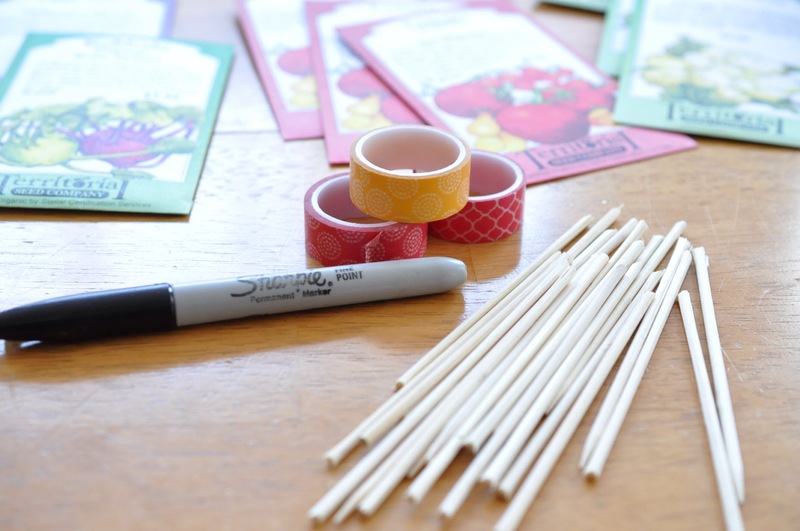 Then I put washi tape on the stick and write the name of the plant. This is what works for me, everyone is different. You just need to make sure you mark your plants well because once they sprout they all look alike for a while! 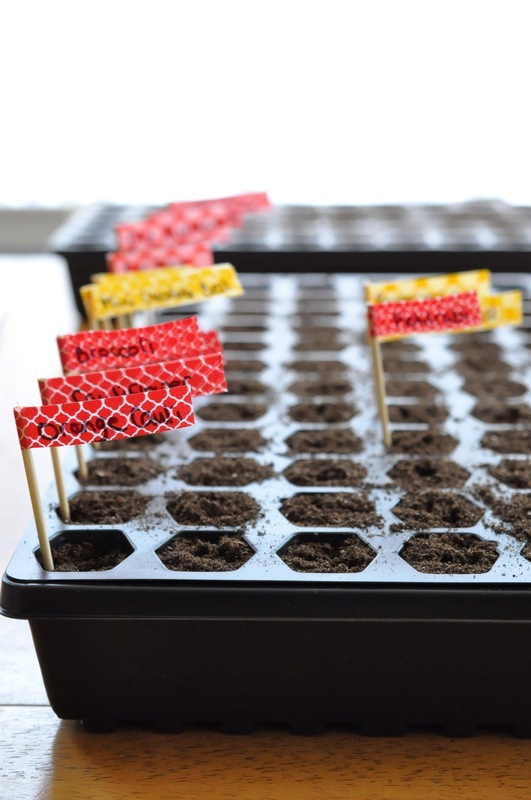 I use the skewer sign to dig a little hole and then drop in a couple seeds, fill it back up and mark the row with the sign. Once the tray is done water it and cover. Sit back and in just a few days you will usually start to see something sprouting. It is so incredibly exciting, the boys love it too. It is well worth sacrificing my kitchen table for 4-6 weeks to have fresh produce right out my door all summer! Eventually the trays get moved to the porch when it warms up a little more. I also plan on doing another tray later. It’s nice to have a second crop of tomatoes later in the summer. Living in the South we have a very long growing season! I highly recommend planting a garden, especially if you have children. 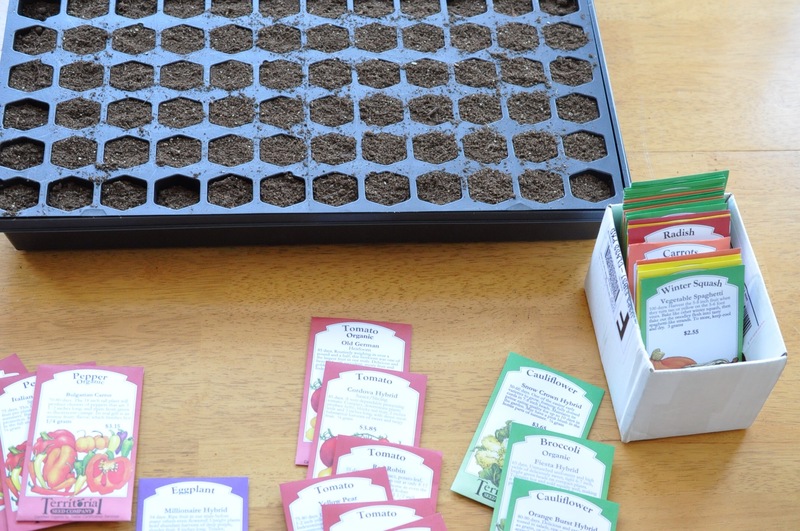 It is an invaluable lesson for them to see their food growing from seed to final product. My children will go to the garden and eat right there. Sometimes it may be a weed they are eating, but it’s something green! They love watching the carrots grow and digging them up, eating them before they wash the dirt off. Usually tomato phobic, they will eat yellow pear or grape tomatoes straight from the garden. If you want your children to eat well this is the best thing you can do for them. Space can be an issue, not everyone has room for a biG garden. There are plants that grow well in pots and would do well on a balcony or other small space. This year I got eggplant, tomatoes and even a watermelon that are supposed to do well in pots. Stay tuned and you’ll see plenty of garden progress. It’s kind of like taking pictures of newborn children, I get so excited and can’t help myself! 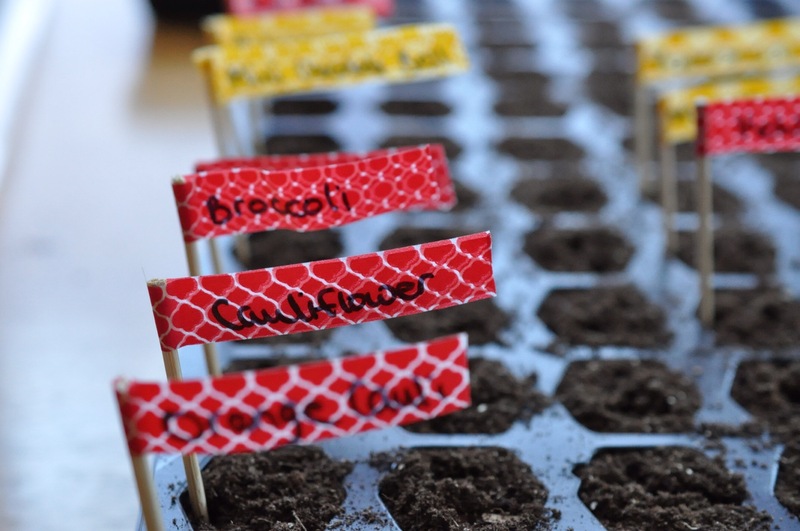 This entry was posted in Garden Bounty and tagged garden, gardening with kids, homegrown food, seedlings, vegetables on February 16, 2016 by Gretchen. I am fortunate to have light, right on the kitchen table! Luckily we still have room to eat around the seedlings for me and the boys, or at the breakfast bar. If all five of us actually eat at the same time it’s in the dining room. Can’t wait to see everything start to grow! I’ve heard of hanging tomato plants, don’t have much need though since there is definitely no fear of a frost here! Good luck with your garden this year. Thank you, I hope it’s a good year! I’m like a kid in the candy store once the garden gets growing! The kids too for that matter. This is wonderful! We do a winter and summer garden. We are anxiously awaiting our carrots that have been over-wintered. I am the same way about tomatoes! Great post! Thanks! Good luck with your summer garden! Looking forward to seeing the results! You use your kitchen to start your seeds, I used to use my bathroom when we lived in New Hampshire, It was the sunniest spot in my house. Good luck with the seedlings. These are some good ideas! I’m done with the seed starters too and my husband is working on the soil preparation these days. 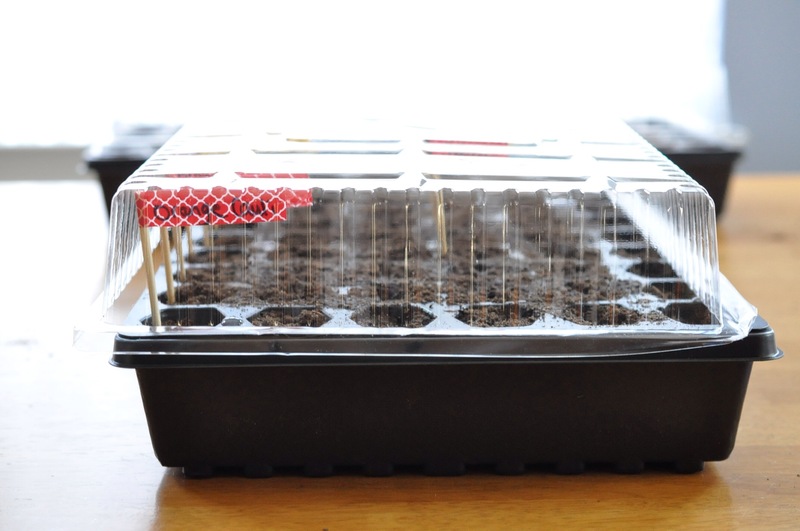 I’m still not entirely done with the garden plan, but I can always improvise the moment I have ready-to-plant seedlings. Got some good ideas here. Thank you for this nice post!